Within Teamwork Projects, you can customize the order in which your saved filters show. This can help you to easily find the filters you use most or help to navigate large lists of saved filters quickly. To organize filters into a custom order, click on the filtering button to the right of the screen. Note: The filters button will be blue when the filters pane is visible. From the right pane you can then select the Saved Filters tab at the top. You will now be presented with a list of all your saved filters. You can hover your mouse over any filter and you will see a cross icon appear, use this to click and drag the filter to any position on the list. Note: When you save a new filter it will automatically be added to the top of the list. You can reorganize this once created. You can organize your filters in any area that allows filters to be saved. 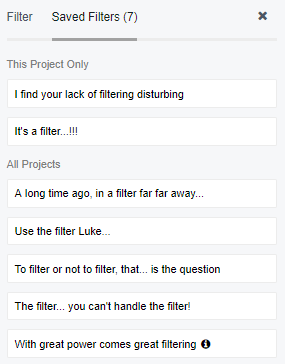 If you have marked a saved filter as "This filter applies to this project only" when saving, it will be listed in a separate section if you have both project specific and non specific filters saved on the project. Note: Only users on paid subscriptions can save filters.